Dominoes are Black Ocellaris the have been selectively bred to exhibit minimal barring/stripes. 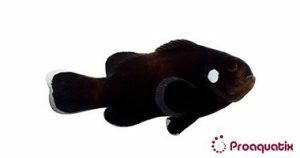 A Domino has at least one white dot on an otherwise all Black Ocellaris. These dots are simply the remnant barring. A domino is a very rare form of an Extreme Misbar Black Ocellaris.